As the weather continues to warm up, the new season’s array of herbs are sprouting up in my greenhouse and all over my allotment plot, the Circus Garden – mint, oregano, chives, parsley, French tarragon, horseradish, basil, coriander, lemon thyme, lemon verbena and fennel, alongside more unusual varieties like blackcurrant sage, lemon basil and basil mint, each offering a range of different culinary possibilities. But one herb has always been there, standing green and proud, through all the seasons and all weathers: the mighty rosemary. Rosemary originates from the Mediterranean but is sufficiently hardy to survive pretty much anything that the UK climate can throw at it. All plants are able to adapt and evolve, but some are more robust than others and less susceptible to extremes of temperature, to drought or to poor quality soil. But where all plants will struggle to adapt successfully is where changes in their environment are sudden or extreme. Whilst rosemary would be almost certainly hardy enough to survive sudden and dramatic climate change, some of these more fragile plants may not be able to adapt in time. I was expecting the UN Climate Science Panel’s report, issued a couple of weeks ago, to such address climate-change-related food security concerns, which it duly did. However, it was interesting to see that the report also went beyond that, to make specific reference to intensive farming, noting in particular that the rate of increase in crop yields under intensive agricultural methods is beginning to slow down. Set against the context of a growing world population this means that we are more rapidly approaching the point where food production will simply not be able to keep up with the growing demand for food. Intensive farming as a concept has only been with us since the end of the Second World War. It has brought us significant short term gains in terms of increased crop yields but it has done so at great cost – soil erosion and desertification, water and land pollution and destruction of insect and other wild life, things upon which so much of our delicate ecosystem ultimately depends. Throw into the equation erratic, climate-change-induced fluctuations in our weather – extremes of temperature, flooding, etc – and food security looks set to become a huge problem for most countries. In a nutshell, we will reach the point in the not-too-distant future where we have too little food and too many people to feed. If we are to adapt successfully to meet that challenge then we need to make some big changes now. We need, for example, to move away from the practice of monoculture and look instead at ways of building up sustainable agricultural practices. This will mean having to accept lower yields but with the longer term prize of greater land and food security. We also need to encourage the developed world away from a diet dependent on a meat industry which (literally) eats up a hugely disproportionate amount of our food and land resources, and which is a major contributor to greenhouse gases. We need to cut through the crazy, twisted logic which underpins much of the global food transportation system, another industry for which the environment pays a heavy cost. More fundamentally we need to change our collective attitude to food. We need to learn to value what we eat. Collective change requires individual change. At an individual level we can make seemingly small adjustments to our own food habits which together can add up to real change, by for example cutting down on meat, buying locally grown, organic produce, by not over-consuming, by reducing food waste in our own homes and where possible by growing at least some of our own food. OK, it’s time to turn our attention to this week’s recipe, which means I have to put away the soap box and don the stripey apron. When we moved into our current house several years ago there was a huge rosemary bush in the front garden which was so big that it blocked out a lot of light to the house. I took a number of cuttings from it before uprooting it. I then replaced the rosemary bush with a tiny wisteria cutting. Those rosemary cuttings were transplanted into the back garden and onto my allotment plot, the Circus Garden, where they are now flourishing, so I don’t feel quite so bad about digging up the original bush. 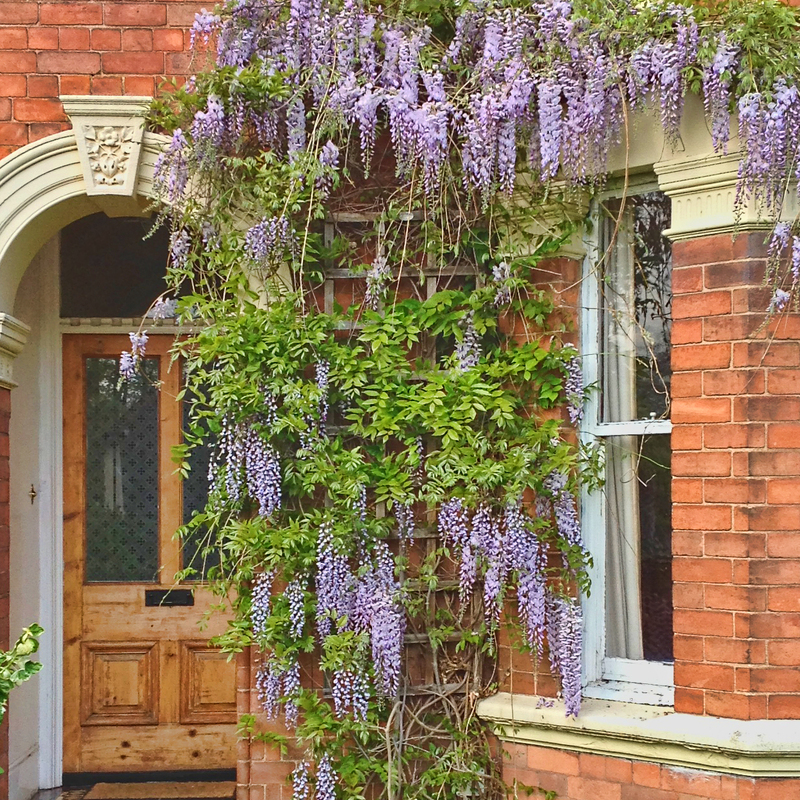 Plus the wisteria cutting is doing pretty well too. 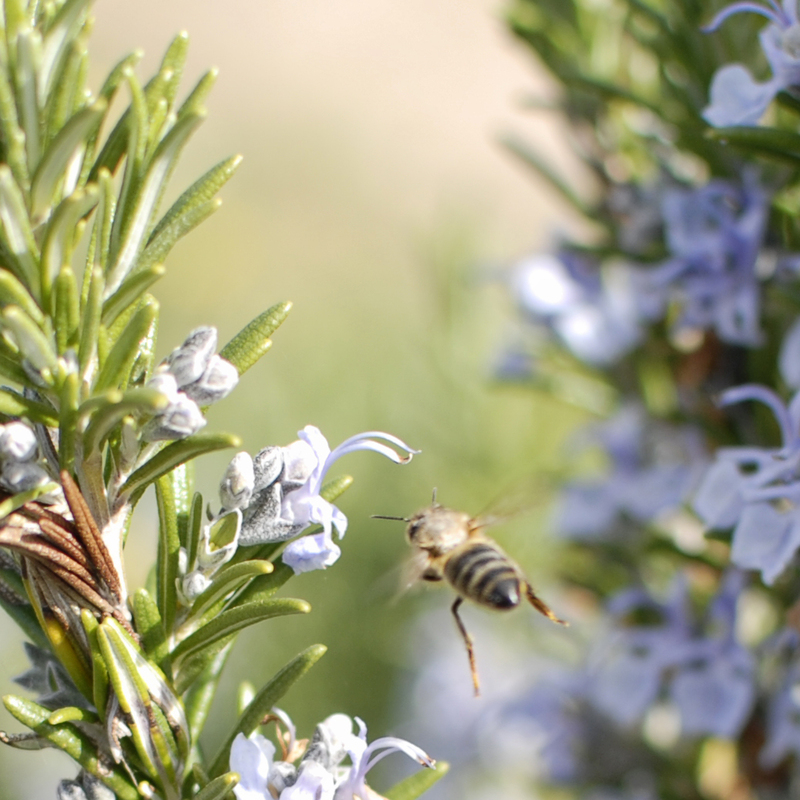 Not only a remarkably hardy evergreen herb, rosemary is also a bee-friendly plant and for the cook it provides a source of fragrance and flavour throughout the entire year. It can work well in sweet dishes as well as savoury, as this recipe demonstrates. Semifreddos are like a cross between ice cream and mousse, and are in fact easier to make than conventional ice cream – they don’t require an ice cream maker as the stiffened egg whites and whipped cream help ensure a light, smooth, even consistency. 1. 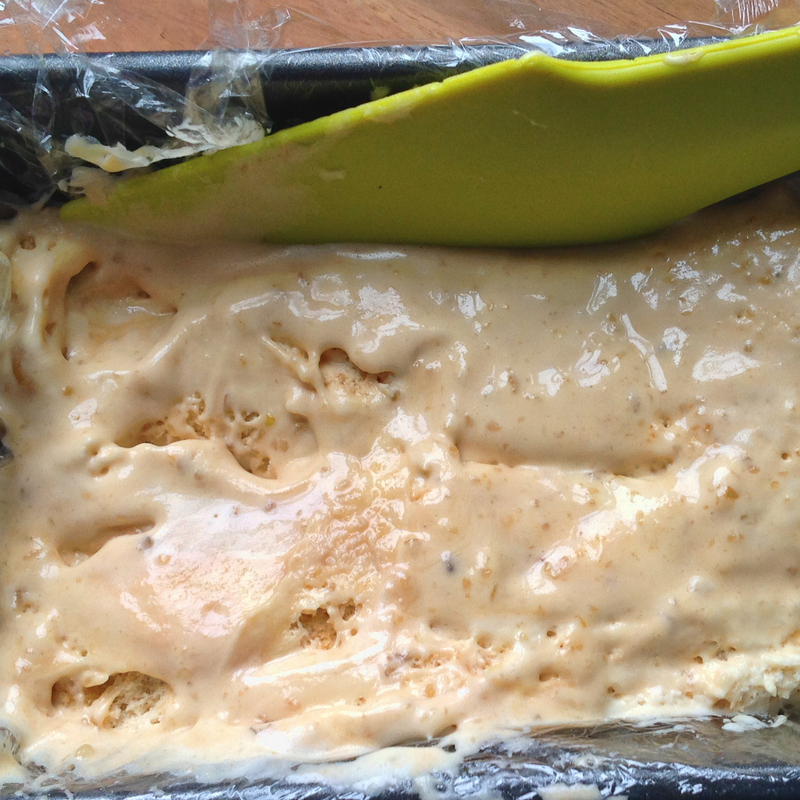 Line a loaf tin or other suitable, freezer-proof container with cling film. 2. Place the rosemary springs in a saucepan with the double cream over a low heat. Keep an eye on the pan as you don’t want the cream to boil. As soon as bubbles appear at the edge of the cream immediately remove the pan from the heat. 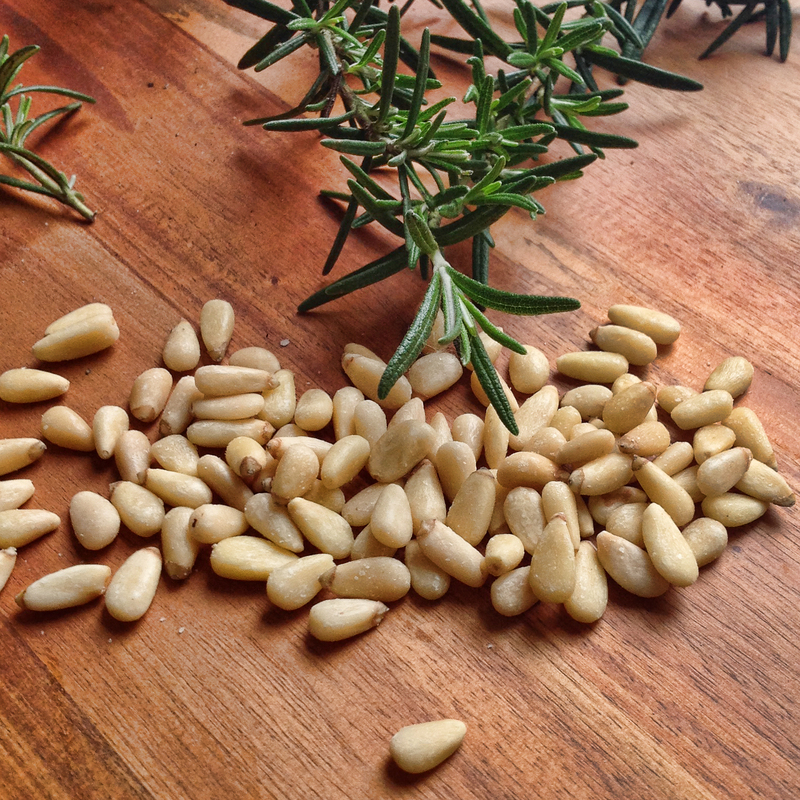 Leave the cream and rosemary to infuse and cool before straining the cream through a sieve to remove the rosemary. Refrigerate the cream until needed. 3. 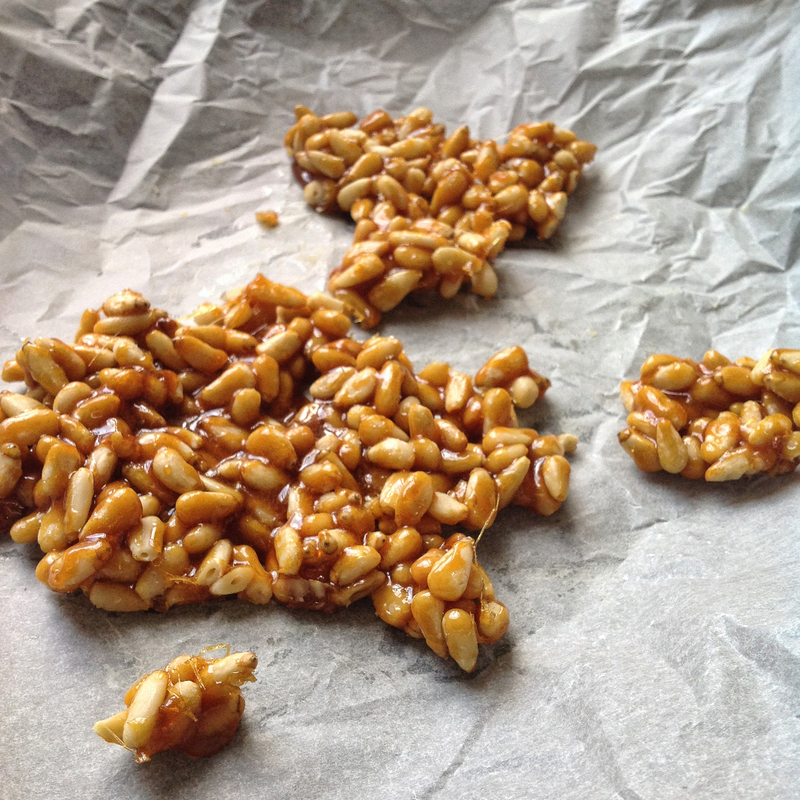 While the cream is cooling, make a pine nut brittle. Lightly grease a large, flat baking tray. Place the caster sugar in a heavy-bottomed saucepan over a medium heat. Don’t stir the sugar but occasionally shake the pan lightly to evenly distribute the sugar over the hot base of the pan. Eventually the sugar will begin to liquefy and colour. Continue to shake the pan to ensure all the sugar melts and continue to resist the temptation to stir (this would reduce the heat and cause crystallisation). When all the sugar has liquefied, again swirl the pan to ensure an even colour. As soon as the liquified sugar turns to a rich amber colour immediately remove it from the heat. Acting quickly but carefully, add the pine nuts to this sugar syrup, stir to coast them evenly then tip the mixture evenly and flatly across the greased baking tray. Leave the pine nut brittle to cool completely then chop into very small pieces or blitz in a mini chopper. Set to one side. 4. In a clean bowl whisk the egg whites with the pinch of salt until soft peaks form. 5. Heat the maple syrup over a high heat until it starts to boil. Very carefully and slowly pour the boiling syrup onto the egg whites mixture, whisking as you do so that the syrup is fully incorporated. The egg and maple syrup mixture will turn a pleasing milky coffee colour, but don’t stop to admire it. Keep whisking for a few more minutes until you end up with a stiff, glossy mixture, similar in consistency to whipped cream. Set to one side to cool. 6. Take the rosemary infused cream from the fridge and whisk until soft peaks form. Gently fold this into the cooled, stiffened egg whites. Finally, fold in the pieces of pine nut brittle. Pour the mixture into the lined loaf tin. Cover with a layer of cling film and place in the freezer for at least six hours. 7. 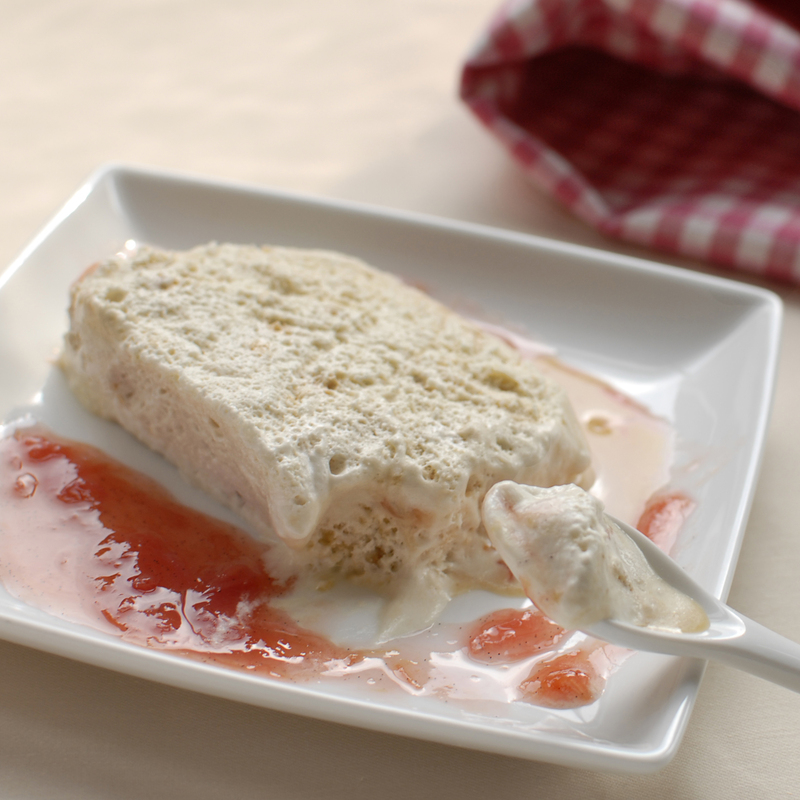 Remove the semifreddo from the freezer 15-20 minutes before serving. The semifreddo is delightful on its own, but would also work well served with a seasonal fruit compote. I agree that we must move away from a predominately meat based diet for the sake of our health and the environment. Whilst we are not total vegetarians in our household, we do enjoy a diet which is probably 75% vegetable based. After browsing through your recipe index, I made your carrot, cashew and coriander fritters the other night and thought they were delicious! Hi Ann. If all meat eaters cut back their meat consumption by just one day a week, as advocated by the “Meatless Monday” campaign it could have a profound effect on the environment as well as on their own health. I’ve always believed that vegetarian and vegan cookery is so much more imaginative and enjoyable anyway. Thanks for the feedback on the carrot, cashew and coriander fritters – it’s great to know they went down so well. Looks delicious! I will try with a non-dairy cream and report back. Thank you Shelley. I hope you enjoy it! Thank you Kevin. I really appreciate your comments, thank you for your kind words.